A Department for Work and Pensions Freedom Of Information request (FOI) yielded a response showing that people having their claim for Employment Support Allowance (ESA) stopped, between October 2010 and November 2011, with a recorded date of death within six weeks of that claim ceasing, who were until recently claiming Incapacity Benefit (IB), totalled 310. Between January and November 2011, those having their ESA claim ended, with a recorded date of death within six weeks of that claim ending totalled 10,600. Bearing in mind that those who were successfully migrated to ESA from IB were assessed and deemed unfit for work, (under a different assessment process, originally) one would expect that the death rates would be similar to those who have only ever claimed ESA. This is very clearly not the case. Furthermore, there are NO alarming increases in mortality rates amongst those who are still in receipt of Incapacity Benefit – there were approximately a million and a half claimants, compared to less than a million ESA claimants for this period. Many of those migrated so far have not yet had a Work Capability Assessment, as the Government decided to re-assess those people when their review from the Incapacity Benefit Personal Capability Assessment is due, for practical reasons. The migration process won’t be completed, it is anticipated, until 2014. David Green from the DWP has urged that “care should therefore be taken when interpreting these figures”. Well I have taken care interpreting this data, Mr Green. My careful interpretation is that there is a probable correlation demonstrated here, linking the reformed Work Capability Assessment process and the withdrawal of lifeline benefits with an increase in mortality amongst sick and disabled people. Incapacity Benefit was fair, it was a genuine social security provision. The “reforms”, including the new Tory-shaped ESA benefit, by stark contrast, are all about taking support and provision away from the sick and disabled, leaving them potentially very vulnerable. It’s very evident that there are measures in place to reduce successful claims for ESA, and many lose their lifeline support for the most arbitrary or manufactured reasons. Those claiming IB were not required to have continuous assessments, whereas those on ESA are constantly required to have the Work Capability Assessment. Many claimants have described a “revolving door” process of endless assessment, ceased ESA claim, (based on an outcome of almost invariably being wrongly “assessed” as fit for work), appeal, successful appeal outcome, benefit reinstated, only to find just 3 months later another assessment is required. The uncertainty and loss of even the most basic security that this process creates, leading to constant fear and anxiety, is having a damaging, negative impact on the health and wellbeing of so many. A significant proportion of those required to have endless assessments have very obviously serious illnesses such as cancer, kidney failure, lung disease, heart disease, severe and life threatening chronic conditions such as multiple sclerosis, lupus, myalgic encephalomyelitis, rheumatoid arthritis, brain tumours, severe heart conditions, and severe mental health illnesses, for example. To qualify for ESA, the claimant must provide a note from a doctor stating that the person is unfit for work. There can be no justification for subjecting people who are so ill to further endless assessments, and to treating us as if we have done something wrong. Marginalising and stigmatising vulnerable social groups via political propaganda in the media, using despiteful and malicious terms such as “workshy” and “feckless” is a major part of the Government’s malevolent “justification” to the public for removing the lifeline support from sick and disabled people, amongst whom are some of our most vulnerable citizens. We are climbing Allport’s Ladder. 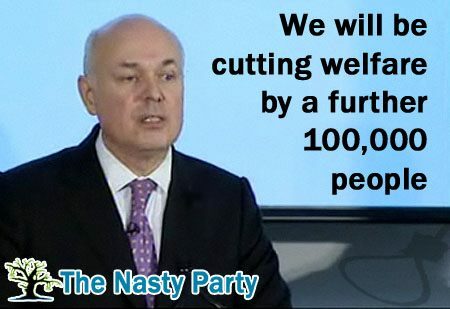 I have often suspected that Iain Duncan Smith is channelling the spirit of Goebbels. The strain of constantly fighting for ESA eligibility/entitlement and perpetually having to prove that we are a “deserving” and “genuine” sick and disabled person is clearly taking a toll on so many people’s health and wellbeing. Many families of those who have died have said that the constant strain, anxiety and stress of this revolving door process has contributed significantly to their loved ones’ decline in health and subsequent death. The figures from the DWP, and the marked contrast between the ESA and IB death statistics certainly substantiates these claims. The horrific, unforgivable and massive increase in deaths over this period coincides with the Government’s totalitarian styled rapid fire legislation – the “Reforms” – in the face of protest, horror, disbelief, fear and mass opposition. The Tories cited “financial privilege” to trample over opposition and stifle dissent, to drown out the voices of protest. Those protesting this Bill notably included many from the House of Lords. I lobbied the Peers, and emailed every single one of them, stating very clearly that the welfare reforms must not happen. I got a high number of encouraging responses. But David Cameron got his own way. Cameron made a Freudian-style slip when he announced to Ed Miliband recently, during Parliamentary debate, that “We are raising more money for the rich.” Not that we didn’t already know this was so. Many of us – around 73 sick and disabled people every week – are paying for that wealth increase for the already wealthy with our very lives. There are many who have so tragically lost their lives because of this malicious Government’s brutal and grossly unjust economic war on the poorest, on sick and disabled people and on the most vulnerable citizens, because of the Tory-led ransacking and plundering of our welfare provision and social support programs. But just one life would be one too many. Many thanks to Robert Livingstone for his outstanding artwork.